In light of potential habitat threats and the rarity of this plant, Carex michauxiana was listed as a special concern species in Minnesota in 1996. It occurs in only three counties in the Arrowhead Region of Minnesota (far northeast counties) and is found at a limited number of locations in those counties. It was first collected in Minnesota in 1944, and has since been found in several types of peatland habitats in the Northern Superior Uplands. Although some peatlands are large and remote giving the impression of relative stability, peatland habitats are nonetheless fragile and vulnerable to degradation on a number of levels. The most obvious threat is direct hydrologic disruptions caused by activities such as road building and ditching. Peatlands, even large, unfragmented peatlands, are also believed to be vulnerable to global climate warming (Gorham 1991; Bridgham et al. 1999; Weltzin et al. 2003). It should also be mentioned that the peat itself is a commercially marketed commodity; hundreds of acres of Minnesota peatland have been drained and mined for peat. Carex michauxiana is a perennial sedge that ranges in height from 15-70 cm (5.9-27.6 in.) and grows in loose clumps. The stems are yellowish or brown, with no red or purple coloration at the base. The leaves are yellowish-green and 1.5- 4.0 mm (0.06-0.16 in.) wide. They may be M-shaped in cross-section or sometimes flat in cross-section. The inflorescence has 2-5 spikes borne on short stalks from a common axis. The uppermost spike is male; the lower spikes are female. The male spike is narrow and almost hides among the upper female spikes. The perimeter shape of the female spike is a broad oval, although the shape and arrangement of the perigynia (the membranous coverings of the seeds) makes the female spikes appear like many-pointed stars. The perigynia are slender and awl-shaped, 8.7-12.1 mm (0.34-0.48 in.) long, and 1.3-2.1 mm (0.05-0.08 in.) wide. They are widely spreading or reflexed (angling downward), and each one tapers gradually to a narrow tip with 2 small teeth. The long, narrow perigynia (4-7 times as long as wide) and the yellow-green color of the entire plant distinguishes this sedge from other Carex species in Minnesota (Wheeler 1981). Carex michauxiana occurs in wet, acidic, and typically peaty habitats. 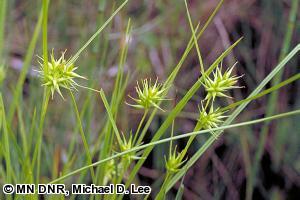 It is most commonly found in poor fens, but also extends into rich fens (Gignac et al. 2004). Poor fens are open peatlands dominated by Sphagnum mosses, fine-leaved sedges, and low shrubs. They have acidic surface water and low concentrations of minerals, such as calcium ions. They are less acidic and less nutrient poor than open bogs. In Minnesota, C. michauxiana has been found on floating mats on shores of lakes and ponds; on rocky, peaty shores; in a shoreline emergent-submergent community; in patterned peatlands; in wet meadow habitats; along streams; and in openings in conifer swamps. It is frequently in areas of low microtopography, including Sphagnum (Sphagnum moss) hollows, along peatland logging trails and other winter roads, and water tracks. Carex michauxiana is found in association with C. lasiocarpa ssp. americana (fen wiregrass sedge), Myrica gale (sweet gale), Chamaedaphne calyculata (leatherleaf), Rhynchospora alba (white beak rush), and Scheuchzeria palustris (scheuchzeria). It can co-occur with several other rare species including Rhynchospora fusca (sooty-colored beak rush) and C. exilis (coastal sedge). Carex michauxiana is a perennial sedge that, like most sedges, is pollinated by wind and dispersed short distances by gravity and possibly water, and long distances by nonspecialized animal vectors. In a study of 37 sedge species in peatlands across Canada (Gignac et al. 2004), C. michauxiana was found to exhibit a narrow range of water chemistry tolerance compared with many other sedge species in peatland habitats. It preferred habitats with surface water pH values between 4.3 to 5.2, and very low calcium ion concentrations (<2mg/L). Carex michauxiana was one of the least abundant species studied, and it tended not to occupy all apparently suitable habitats. The best time to search for C. michauxiana is when it is fully flowering or with mature seeds (late June through mid-August). Because C. michauxiana has such a narrow range of tolerance for water chemistry, it has likely always been rare in Minnesota. In some landscape settings, available habitat may vary over time due to periodic natural disturbance associated with hydrologic changes resulting from beaver damming activities. Potential threats to the species include outright destruction of its habitat and physical, chemical, or hydrological alterations of habitat conditions. Many populations are located in boggy areas where people typically do not recreate. However, these saturated peaty substrates can be torn up and disturbed when visited, especially with motorized equipment. Most of the known populations of C. michauxiana occur on state and federal land, and several peatlands in public ownership are known to have relatively large and healthy populations. The Minnesota Biological Survey has completed botanical surveys in much of the state and efforts are ongoing in the northernmost subsections of Minnesota. Several new populations of C. michauxiana were discovered in the Border Lakes in 2009 and it is likely that additional populations will be discovered as surveys continue. Gignac, L. D., R. Gauthier, L. Rochefort, and J. Bubier. 2004. Distribution and habitat niches of 37 peatland Cyperaceae species across a broad geographic range in Canada. Canadian Journal of Botany 82(9):1292-1313. Pastor, J., B. Peckham, S. Bridgham, J. Weltzin, and J. Chen. 2002. Plant dynamics, nutrient cycling, and multiple stable equilibria in peatlands. American Naturalist 160:553-568. Wheeler, G. A. 1981. A study of the genus Carex in Minnesota. Dissertation, University of Minnesota, St. Paul, Minnesota. 501 pp.